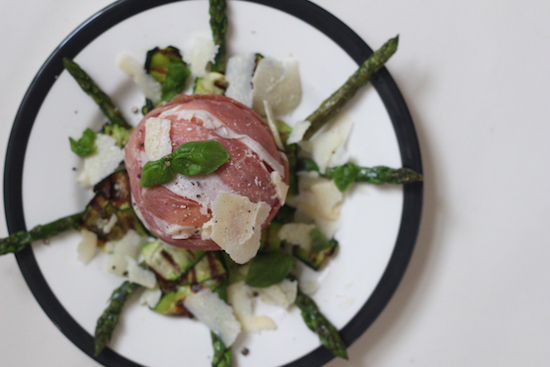 Emily's Recipes and Reviews | UK Food Blog | Leicestershire : prosciutto wrapped burrata with a chargrilled asparagus, courgette and grana padano salad. Step one. Begin by wrapping the mozzarella in slices of prosciutto, layering it to neatly show off the lines of fat running through the ham. Set aside. Step two. Use a potato peeler to create thin strips of courgette. Put your griddle pan on a medium heat with a dash of olive oil. Grill the courgette slices and asparagus with a little salt and pepper for 5-10 minutes until charred. Carefully turn with tongs half way though. Step three. Assemble the salad firstly with asparagus in a clockwise formation, layering the courgette ribbons on top. Place the prosciutto and burrata on top, followed by shavings of Grana Padano also made with the peeler. Step four. Garnish the dish with black pepper and a scattering of fresh basil. You shouldn’t need salt here as the Grana Padano beautifully balances this out. I'm entering this dish into the Prosciutto di San Daniele and Grana Padano Cheese recipe competition - wish me luck! Find out more recipe inspiration over on Twitter at Grana Padano and Prosciutto di San Daniele DOP , or the hashtag #EnjoyingPDO!